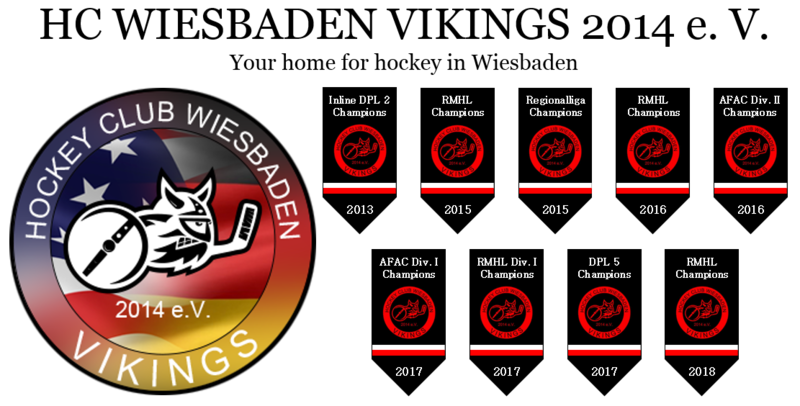 ABOUT US – HC WIESBADEN VIKINGS 2014 e. V.
The Wiesbaden Vikings are an English/German-speaking ice and inline hockey club located in and around Wiesbaden, Germany. Many of the players are North Americans or Germans living in the Wiesbaden/Frankfurt area, but the team welcomes players of all nationalities. During the ice hockey season the Vikings form four teams (Vikings BLACK/Vikings RED/Vikings WHITE/ Vikings GREY) and compete in the Rhein-Main Hockeyliga and Die Players Liga. They also play in many tournaments throughout the year, including the Cuddeback Cup (Zweibrucken, Germany), the Armed Forces Alpine Classic (Garmisch-Partenkirchen, German), the Colombes Cup (Paris, France), and the Rockets Cup (Limburg-Diez, Germany). The Vikings also annually host the Viking Cup over the Thanksgiving Holiday weekend at the Henkel Kunsteisbahn in Wiesbaden, Germany. During the inline season the team competes in the Die Players Liga and the Regionalliga Sud. If you are interested in playing ice and/or inline hockey with other English/German-speaking players in the Wiesbaden/Frankfurt area, contact the Vikings at mail@wiesbaden-vikings.com. We accept players of all skill levels, from beginners to former university-level players. The only requirement is that you love to play hockey!